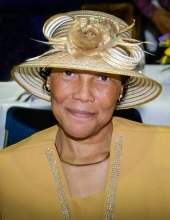 Mamie Williams Durham Baker, 75, 2317 Scouting Court, High Point, died January 29 at her residence. She was born in Vance County to the late Robert Williams, Jr. and Estelle Alexander Williams. A Funeral Service will be held at 1 pm, Saturday, February 9, 2019 at St. Delight United Holy Church. Interment will follow in the church cemetery. Survivors include two sons, Eugene Durham, Jr. (Kathy) and Christopher Durham (Alison); one daughter, Florence Denise Baskerville; seven grandchildren; two sisters: Estelle Roberts and Luna Florence Steed (Morris). Viewing will be from noon to 7pm, Friday, February 8, 2019 in the funeral home chapel and at the church prior to the service. The family will receive friends from 6 to 7 pm, Friday In the funeral home chapel. To send flowers or a remembrance gift to the family of Mamie Durham Baker, please visit our Tribute Store. "Email Address" would like to share the life celebration of Mamie Durham Baker. Click on the "link" to go to share a favorite memory or leave a condolence message for the family.